Add Micrococcal Nuclease for Chromatin Assembly (500U/ml) to my shopping cart. Micrococcal nuclease or MNase is a 16.9 kDa endonuclease derived from Staphylococcus aureus. It is purified from an E. coli strain expressing an N-terminal 6XHIS tagged micrococcal nuclease. Purified protein exhibit an strong endonuclease activity against single-stranded, double-stranded, circular and linear nucleic acids. The enzyme is active in the pH range of 7.0 - 10.0, with optimal activity at pH 9.2 for both RNA and DNA substrates. The rate of cleavage is 30 times greater at the 5’ side of A or T than at G or C and results in the production of mononucleotides and oligonucleotides with terminal 3’-phosphates. MNase is suitable for removing nucleic acids from cell lysates, releasing chromatin-bound proteins and shearing chromatin for use in chromatin immunoprecipitation (ChIP) experiments. SDS page of the micrococcal MNase. The position of the protein of interest is indicated on the right; the marker (in kDa) is shown on the left. MNase activity assay. 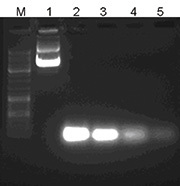 0.5 μg plasmid DNA was digested with the Diagenode MNase (concentration 5U/ml) in a buffer containing 20 mM Tris-HCl Ph 7.6, 3 mM CaCl2 and 0.01% BSA and analyzed by agarose gel eletrophoresis. The digestion was carried out for 0.5, 1, 2 and 4 minutes (lane 2, 3, 4 and 5, repectively). An undigested control is shown in lane 1. Diagenode strongly recommends using this:	Micrococcal Nuclease for Chromatin Assembly (500U/ml) (Diagenode Cat# C06070001-100). Click here to copy to clipboard. Add Chromatin Assembly Kit to my shopping cart.